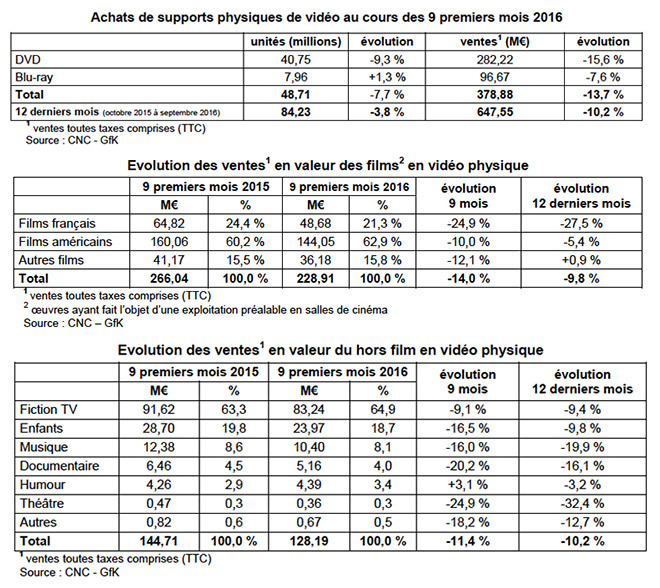 French physical media market falls 7.7% in volume and 13.7% in value during the first nine months of 2016, according to the latest statistics from the Centre National de la Cinématographie (CNC) based on GfK data. Between January and September 2016 sales of DVD and Blu-ray discs amounted to €378.88 million. Household spending decrease by 13.7% over the same period in 2015. Consumer spending on DVD fell 15.6% to €282.22m and spending on Blu-ray fell 7.6% to €96.67m. The Blu-ray format accounted for 25.5% of disc sales in the first nine months of 2016 compared to 23.8% over the same period the previous year. As regards volumes, the combined number of DVD and Blu-ray discs sold during the period dropped by 7.7% compared to 2015, amounting to 48.71 million units – 40.75 million DVDs (-9.3%) and 7.96 million BDs (+1.3%). The average price of a new DVD titles dropped by 3.5% to €18.86 whereas a catalogue title went up 3.5% to €10.44. The €:3 to €8 price range accounted for the largest slice of the DVD market (19.3% of total sales) and the largest volume (34.3% of total unit sales. DVDs priced below €3 accounted for 1.4% of revenues and 9.3% of units. The average price of a new Blu-ray title was €21.07 over the first nine month of 2016, unchanged from the previous year. Catalogue Blu-ray titles went for €12.15, a 0.9% drop compared to 2015. BD discs priced between €10 and €13 accounted for the largest slice of the market (26.5% of total sales). Value-wise, 27.3% of sales are accounted for by BD titles sold between €20 and €25. The physical media market is dominated by movies, that account for 60.4% of total video sales and which brought in €228.91 million. This is a 14% fall compared to the same period in 2015. This fall is explained by the drop in sales of DVD films (–16.3%, €150.88m). Blu-ray discs recorded a smaller drop (–8.9%, €78.03m). In volume terms, films on DVD and Blu-ray fell by 7.7% to 22.67 million units. French films generated €48.68m during the first nine months of 2016 – a 24.9% drop from the same period in 2015. Some 4.97 million DVD and Blu-ray discs were sold – a 12.4% drop over the previous year. French films account for 10.4% of Blu-ray sales. DVD sales of American films contracted as well by 10% to €144.05m. However, their market share increased to 62.9% (60.2% in 2015). Some 14.12 million DVD and Blu-ray discs of American films were bought in France between January and September 2016. They accounted for 71.8% of Blu-ray sales. 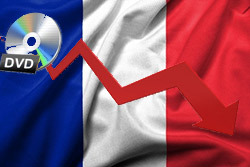 Earlier last year, IHS Home Entertainment issued French video market forecast for 2020. The market researcher expects physical video sales in France to generate 29m retail unit sales and €382.2m in consumer spending that year. These figures represent a compound annual decline of 9.3% and 11.2% respectively over the forecast period. DVD will continue to dominate, accounting for 23.9m of unit sales (82.5%) and for €281.1m of spending (73.7%) by 2020, a compound decline of 9.4% and 11.7% respectively. BD will account for 5.1m unit sales and €101.1m of consumer spending, a compound yearly decline of 9.2% and 9.9% respectively. IHS reckons that the penetration of Ultra-High Definition Blu-ray Disc (UHD) may boost consumer spending on BD. More titles are becoming available on the format, which is essential to the growth of its popularity. The popularity of 4K TV sets has gained momentum as a result of the UEFA European Championship. IHS expects 4K TV units to account for 28% of total TV sales in Western Europe in 2016, and for 40% in 2017. The analyst expects the decline in physical media sales to gradually start plateauing from 2018 onwards, at which point BD will perform significantly better than DVD. In 2020, the decline for BD in terms of consumer spending is forecast at 6%, and for DVD at 9%. Average unit prices for physical media will continue to decline over the forecast period, but at a slower rate than was seen in the previous few years. This is partly explained by the likely discontinuation of the aggressive price reductions seen in recent years, as this strategy has proven to be ineffective in curbing the decline of the market up to the present point. Also, the price reduction will be more significant for DVD than for BD, as the growing popularity of UHD sales will help maintain average prices for Blu-ray Discs.